Holiday themed photo shoots are the perfect opportunity for testing out your creativity. By using different props and set designs, you can easily make your unique and captivating ideas come to life. With the start of February upon us and Valentine’s Day just around the corner, this is the best time to plan a holiday-themed shoot. 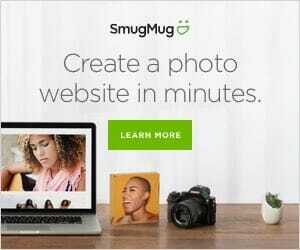 Whether you are photographing couples, children or even your own family, here are 10 Valentine’s Day Photo Shoot Ideas for you test out this love-filled season. 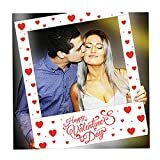 One idea for creating Valentine’s Day images is to pose your subjects while they create hand hearts. Hand hearts are a simple and effective gesture to showcase that feeling of love between two people. This can be done with couples, families and even friends. 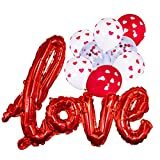 A perfect prop for Valentine’s Day photo shoots are balloons. Are you photographing babies or newborns this Valentine’s Day? A perfectly cozy idea is to create a heart-shaped blanket to lay the baby on. Not only will they look adorable, but they will look just like small bundles of love. Flowers are one of the universal gifts of love and appreciation, especially when given on Valentine’s Day. 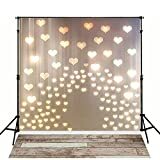 Add this as a prop to any of your photographs and instantly experience the Valentine’s Day magic. If you are capturing a couple’s Valentine’s Day engagement, consider using roses to present the ring. Not only will this be a beautiful photograph, it will be a perfect way to commemorate this special day for the couple. If your subjects aren’t keen on the idea of using props in their photographs, you can still create the mark of Valentine’s Day in nature. Whether you’re shooting at the beach or in an open field, you can draw hearts in the sand or use leaves, flowers or branches to create this symbol of love. Another prop that can be used for your Valentine’s Day photo shoot is a heart-shaped lock. Photograph your couple, family or friends placing their lock on a bridge or gate to showcase their bond, connection and love for one another. They can even write their initials and date on the lock to remember the moment. Next to flowers, chocolate and candy are two gifts most often given on Valentine’s Day. Showcase your subject’s sweet tooth by photographing them eating candy, chocolate or anything in the shape of a heart. The sweeter, the better! The best way to showcase your Valentine’s Day spirit is to direct your subjects to dress in red, pink or even white clothing. They can be in full color or even use these colors as accents for their outfits. On Valentine’s Day, reds and pinks are the go-to color palette. 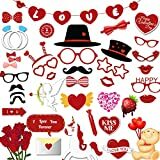 From hats to glasses, lips, and ties – this package has every type of Valentine’s Day prop you could need! 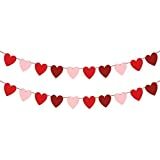 Hang these on your set as the perfect Valentine’s Day background. BUY NOW ! and make you special day more memorable ! These are some of the ideas, props and set designs you can create for your creative and unique Valentine’s Day photo shoot. Do you have any ideas for photographing this holiday of love? Share with us your suggestions in our comments below!